Crystal healing is a complementary therapy which focuses on the underlying cause of the disease (something not at ease with itself) behind the disease or illness within the body. Crystals take into account all the different parts of our being; physical, emotional, mental and spiritual and reaches the cause of dis-ease no matter where it is sited. As well as relieving symptoms, crystals may also reveal the root of the problem so that you can put about the necessary changes to avoid the symptoms from reoccurring. Where there is an imbalance or disease, crystals gently realign patterns and subtle bodies, bringing them back into balance and creating a state of wellness. Crystals have a subtle but measurable effect on our body. They have the power to balance, protect, enhance, energise, strengthen and uplift. They can greatly enhance our levels of confidence, concentration and self-esteem. When worn or placed on the body, crystals can draw out energy toward itself, removing imbalances from the aura, gently dissolving and transmuting negativity. They can motivate us to bring about a sense of empowerment and achievement; helping us to stay focused in order to achieve our goals and life purpose. Crystals can be used for just about anything and their unique healing energies are as individual as we are. There is a crystal and mineral for every illness or disease known to mankind; we just need to heighten our awareness and frequency to that of the crystal so that we can tap into the energies and benefit from what their metaphysical properties have to offer. 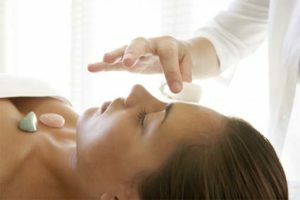 A Crystal Reiki healing session includes a full hour of Reiki ‘hands on healing’ with intuitively selected crystals placed on the body in a particular pattern to rejuvenate, refresh and balance the mind and body. Crystals are usually placed on the main seven energy centres on the body called chakras, with a selection of quartz points placed on and around the body to direct and enhance the flow of energy both above and below where crystals are placed. In addition to the crystals intuitively chosen by the Crystal Healing Practitioner, the client will also be intuitively guided to select various Crystal Alley Cards and the related crystals will be placed on the client for the healing session. The client will also be given channeled spiritual guidance from the crystal cards selected. 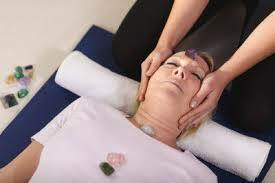 Once the Reiki session is finished and the crystals removed the Crystal Healing Practitioner will commence repairing and cleansing any remaining negative imprints, holes, tears or leaks in the auric field with a quartz wand and the entire auric field and chakra system sealed with psychic protection.